The primetime for snorkeling the waters of Destin is April through November, but this charter is available year-round for the brave! All snorkel gear is included such as masks, snorkels, fins, noodles, nets, and buckets. 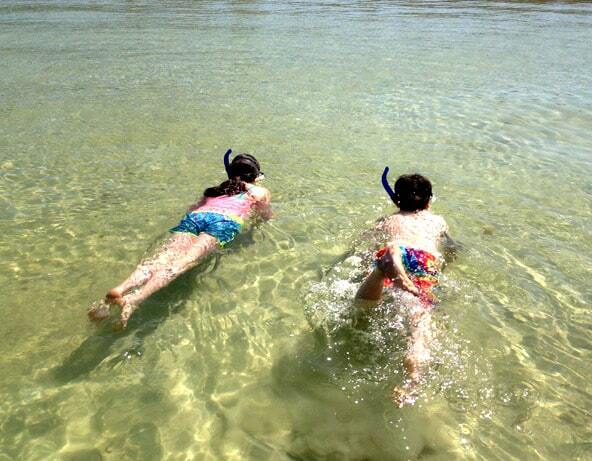 We have several snorkel locations to choose from, including shallow water to look for shells and hands-on marine life or venture into deeper water for sand dollars. Whichever you choose, our sailing charter is here to accommodate. Sail Away Charters has everything you are looking for adventure on your vacation. Some people are nervous the first time they wear a snorkel and mask. This is a safe and fun activity for all ages. Rest assured, our captain has years of experience and keeps your safety in mind. Our charter gives personalized instructions for everyone on board. Captain Bryan is also CPR certified in case of any unforeseen emergencies. We also provide filled ice coolers, just bring your beverages and snacks. Our Snorkel Adventures is a fun activity to be enjoyed by people of all ages. Whether you have little children or older family members, we have equipment that fits everyone. All of our charters can be enjoyed by families, couples or groups of guys and ladies for special occasions like bachelor or bachelorette parties. We welcome everyone on our sailboat. You can choose between exploring the more shallow water (waist deep) or brave higher depths where you can experience more of the unique treasures of the ocean. Our charter tours are the perfect way to enjoy your private charter while spending time in the water. Jump off the boat and have a blast and memories to last a lifetime! Call us today to book your Spring Break and Summer snorkeling charter. We look forward to sailing away with you.